An excellent pub in a lovely Surrey town. Tucked away in a quiet area but not at all far from the station. Ales weren't the most imaginative selection but were well kept nonetheless. The oeuvre of what was presumably the barman's mate's indie band provided the musical backdrop. An OK pub but there are more characteristic pubs, with a wider range of ranges, nearby - e.g. the Lamb. Friendly, vibrant pub with a decent selection of ales (much to my delight). I don't go there often enough (once or twice a month), but I can highly recommend the place. Wide range of ages apparent and a good outdoor area for the sunnier months. Has been brilliant this year. Younger crowd, clearly inspired to visit due to its proximity to the local college gives this pub it's gritty student-bar feel. Food prices seem reasonable and the portions larger than expected. Evening crowds tend to be "eclectic" in nature with a surprising range of ages. Not bad for a drop-in occasional visit, but does not cater for all tastes, although that is not in itself a bad thing. Would visit again during the day, maybe not so much in the evening as the clientele are not the kind that I would personally fraternize with. 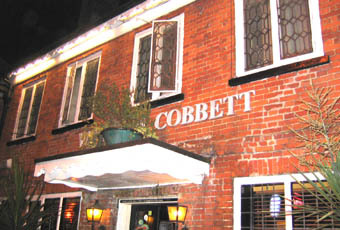 Anyone who has visited and enjoyed the Hobgoblin in Reading will feel at home in the William Cobbet. Although more conventional in layout than the Hob, the Cob shares many other things in common. Excellent Real ale - we couldn't resist trying the Cream inspired fff Brewery Pressed Rat and Warthog and were rewarded for our bravery. Walls and ceilings plastered in beermats and handpump badges. And the music of course - Zepp, Kansas and many guitar based makers of noise. And some wacky furniture, and even some records pinned to the wall. Food was fine, basic but at prices to match. Bacon and Cheese Burger with chips at �5.95, although the "Double D" burger doesn't have the shape you might expect. Close to the college, this must be popular with students as well as us old folk. Would happily re-visit.